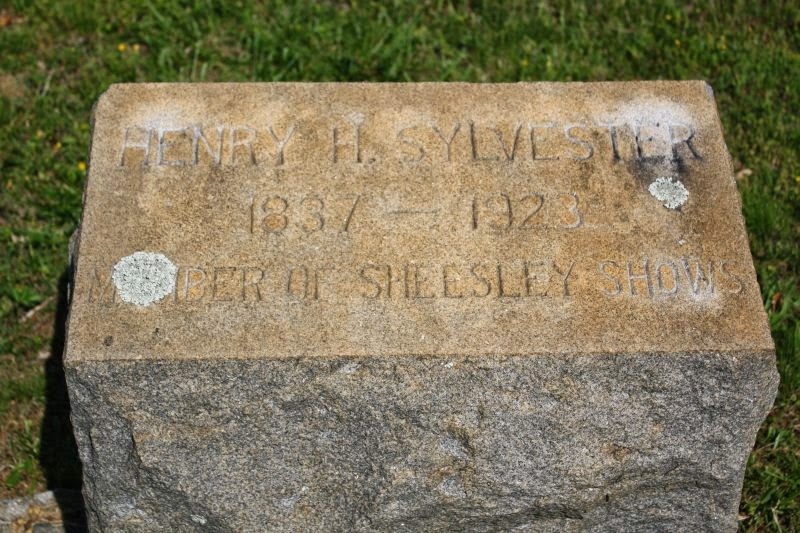 I took this photo of Henry H. Sylvester’s grave marker near the Babyland section of Oakwood Cemetery in Raleigh well over a year ago. Obviously what interested me the most was the inscription, “Member of Sheesley Shows.” I thought I’d wandered into another Showmen’s Rest, but this was the only marker in the area that suggested a circus professional’s grave. My usual research yielded nothing about Henry’s life and very little helpful information on the Sheesley Shows (a traveling carnival outfit) so I put his story on hold. Often details of peoples’ lives (or deaths) don’t emerge initially. I don’t know if this delay in discovery is due to luck, database updates, or mysterious keyword algorithms. I fancy the notion that perhaps a narrative reveals itself only when it’s ready to be shared, but then again I’m a dreamer. In May I found Henry’s death certificate. 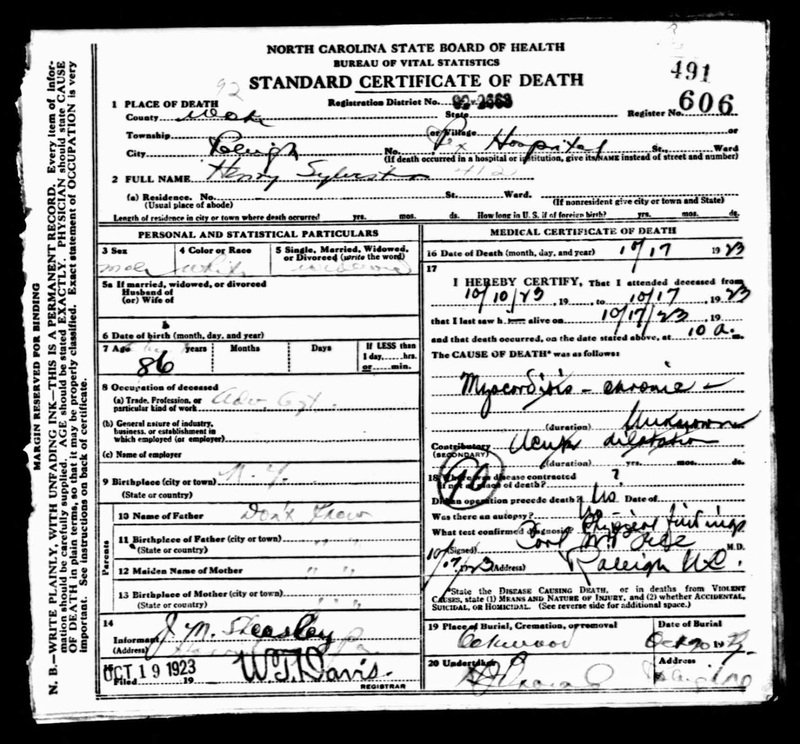 This was a extremely helpful because it contained important demographic information such as marital status, his occupation, and the cause of death. Henry was born in New York in 1837 and died on October 17, 1923 at Rex Hospital of chronic myocarditis He was a widower, aged 86, and his occupation was “advertising agent.” The informant on the certificate was J.M. Sheasley (John M. Sheesley-the owner of the carnival), which suggests that Henry didn’t have any relatives or if he did, there was some other reason why Sheesley’s name was on the document. I looked for anything indicating that Henry had ever been married but was unsuccessful. The one death notice I came across mentioned nothing about his possible widower status, so either I missed something or there was a mistake on the death certificate. There are still plenty of gaps in Henry’s biography, such as when and how he landed in the circus business. 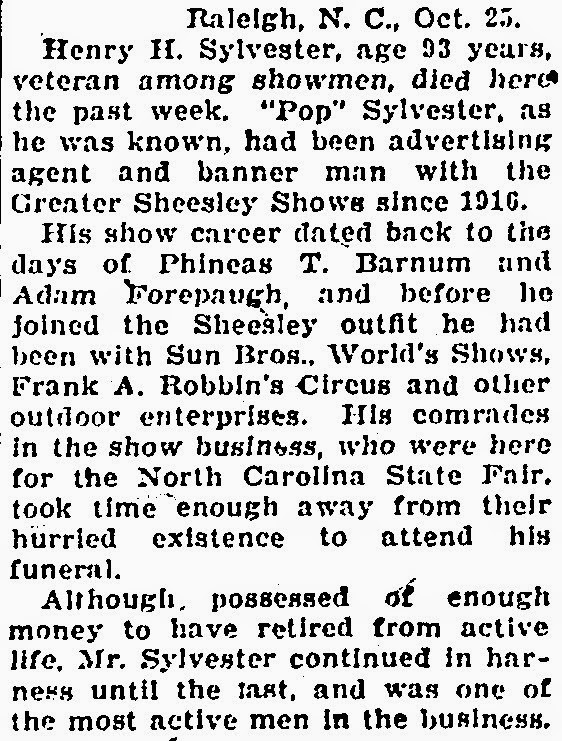 In addition to working for the Greater Sheesley Shows, “Pop” Sylvester also spent time with Sun Bros. World Shows, Frank A. Robbin’s Circus, and other carnival outfits, scouting locations and hanging circus banners and bills. It may have also been his duty to arrive days in advance of the rest of the circus to drum up interest in the show. Such a person would’ve possessed a dynamic, outgoing personality and exceptional persuasion skills. Images of the Sheesley Shows from 1916 (when Henry joined the carnival) are up at Sideshow World, which gives you an idea of some of the sights and people he might have encountered in his daily life if you’re interested in that sort of thing. 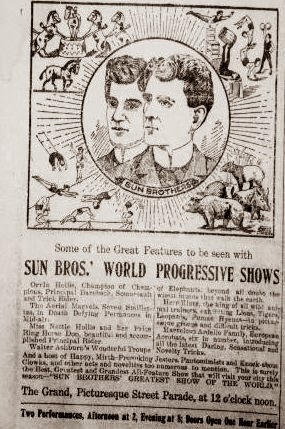 Henry apparently remained active in the circus business up until his death and because he died during the North Carolina State Fair, his fellow circus brethren were in town and able to attend his funeral.